When celebrated director and producer, Michael DiLauro set out to create a new documentary for the City of Pittsburgh, he called upon Emmy winning composer, Chris Orazi of CAS Music Productions to compose the score. We Built This City will air on PBS in markets nationwide. The documentary tells the story of the evolution, struggles and ultimate success of the Allegheny Conference on Community Development in making Pittsburgh, PA, America’s most livable city. 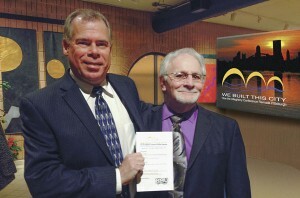 Pictured at the screening of We Built This City are (l to r): Chris Orazi of CAS Music Productions in Vineland and award-winning director, Michael DiLauro. The score incorporates acoustic jazz elements, as well as contemporary styling. CAS employee, and Minotola resident, Al Pellegrini, helped engineer and sound design the project. Local musicians featured on the soundtrack include: Kathy Epifanio of Vineland on vocals, John Workman of Vineland on guitar, Ana Achitei of Glassboro on cello and John Guida of Vineland on saxophones and flute. Orazi also performed on the soundtrack. A director and producer of documentaries, television programs, commercials, and corporate productions, DiLauro has earned five regional Emmy’s, a Blue Ribbon at the American Film Festival, several ADDU awards and the Gabriel award for outstanding television programming. He is also the Director of the Academic Media Center and Assistant Professor in the Media Arts Department at Robert Morris University. Orazi is an accomplished composer, conductor, arranger, producer, audio producer, sound designer and founder of CAS Music Productions. Established in 1984, the company provides award-winning audio-visual production for radio, television, film, and web-based media. It owns and operates an on-site, custom music and sound production studio. The CAS technical design, programming and installation team is now a leading provider of audio-visual solutions for commercial and residential environments. To find out more, visit casmusic.com.